The MK1 Aviators Night Vision Illumination Device (ANVID) Finger Light (NSN: 6230-01-411-0814) was introduced as compact, focused short-range lighting tool providing the user with immediate supplemental light to aid in the performance of critical tasks. The MK1 Aviators Night Vision Illumination Device (ANVID) Finger Light (NSN: 6230-01-411-0814) was introduced as compact, focused short-range lighting tool providing the user with immediate supplemental light to aid in the performance of critical tasks. Originally designed for pilots, the popularity of these simple-to-use lights have made them required tools for ground forces, battle tank, medical personnel and logistics staff. Anywhere hands free light is needed, the finger light has found a home. Affixed to the top of the users index finger with the included Velcro strap, the operator can easily switch the light ON or OFF with their thumb via the units side toggle switch. The MK1’s virtually indestructible light emitting diode (LED) light is available in a variety of colors including Amber (Yellow), Blue, Bright Green, Red, White, IR and a reduced emission NVG green for use in conjunction with Night Vision Equipment. 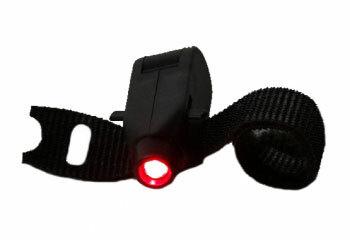 The finger light is ideally suited for operations requiring minimal light or situations where preserving night vision while navigating, tracking, map reading, or other close work is critical. Powered by twoA76 Batteries, the MK1 Finger Light will provide light over several hours of operation.